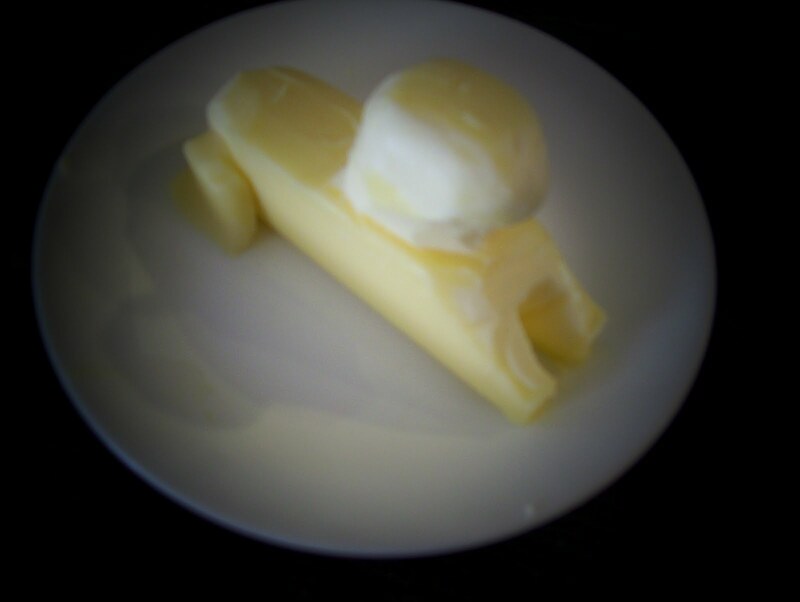 Butter and Margarine have a long and conflicted history. As contradictory as it seems, margarine was invented in France. It took decades for margarine to make it to the United States, however, and when it did the butter industry was very unhappy that this immigrant was allowed to come ashore. 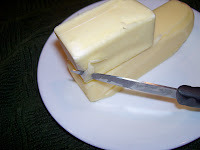 Butter lobbies worked long and hard to stop the production of margarine. Several state legislatures tried to force it's manufacturers to add pink coloring to make the product look too horrible to eat. Bootleg margarine became common, and the manufacturers of margarine would sometimes supply food-coloring capsules so the housewives could knead the yellow color into the margarine before serving it. The fight between these two factions would probably have continued if fate had not intervened. During both world wars, the production of butter was very limited and quite expensive; this gave the cheaper and more plentiful margarine producers a definite edge. By the time WWII ended, the margarine lobby was large enough to have real power in Washington and restrictions against it were finally lifted. Ironically, today, yellow color is often added to real butter so it will look more like the more common and widely used margarines. When I was growing up, we used butter very sparingly - this was probably another depression-era money-saving habit my mother observed. The first time I tasted real butter, I thought it had the most wonderful flavor and I loved it on a list of foods like hot bread, artichokes, lobster and shrimp. The fragrance and taste of melted butter was something no margarine could duplicate. Every Easter I create a real-butter lamb for our dinner table. 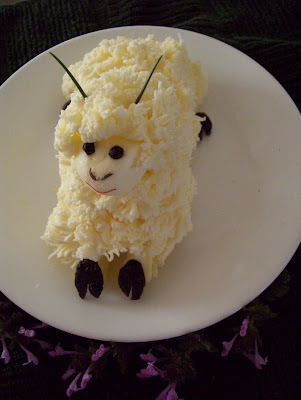 I could probably make one with sticks of margarine, but historically, these little lambs were made from butter and I feel I should continue the tradition. Ingredients: 2 sticks of butter, 2 whole black peppercorns, 2 caraway seeds, a tiny piece of red thread, 2 chive ends and 4 coffee beans or raisins. Cut one stick of butter in half and place on one end of whole stick as shown. Place on small serving plate. Keep remaining butter in refrigerator. Use photo to guide shaping process. Shave inward from point of chin to top of forelegs, about 3/4 inches from body. Cut away center between forelegs. 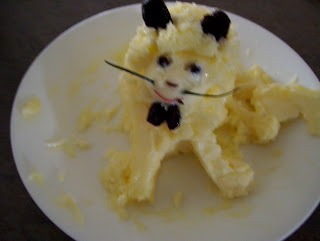 Do not be too concerned with carving abilities as most of the structure will be covered with butter 'wool'. Shape the head, next. Gently shave and smooth corners with you fingers. Add thin shavings to extend out the lamb's face. Again, use your fingers to smooth out angles. The face will be exposed, so it needs to be well formed. Shape the back and hindquarters and cut away slightly the lamb's undersides to form a belly; you can add some of these shaving to extend the hind legs. Place the lamb and scraps in the refrigerator for 15 min. so they can become cool and firm. Use reserved 1/2 stick of butter, cut into pieces as well as any scraps to make the wool. 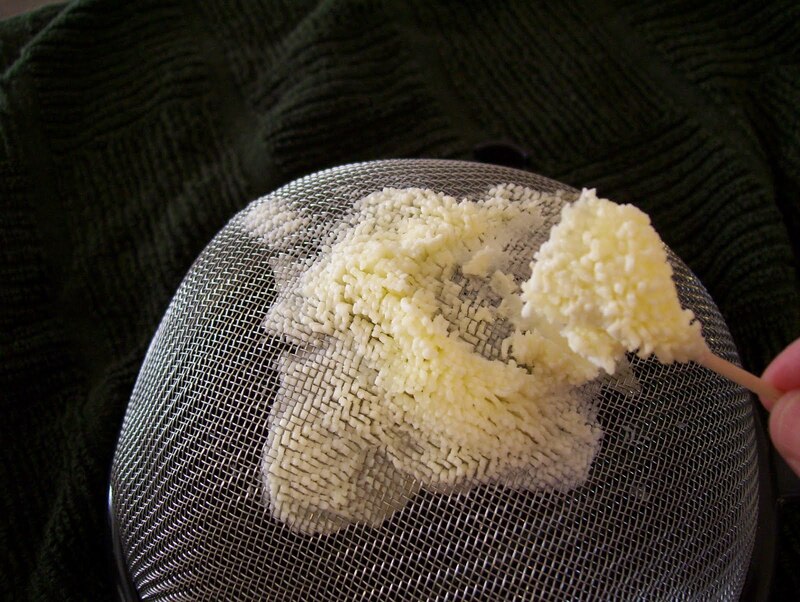 Press the butter, a little at a time, through a sieve with a spoon. Scrape the wool off of the screening with a toothpick and place it on the lamb body. I usually start at the back end and work my way forward. Cover all areas except the face and fronts of the forelegs. 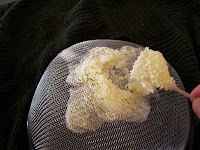 If you do not have a sieve, you may make the butter wool by pressing it through a garlic press...this is a more time-consuming method, but it does work. Add peppercorns for eyes, the caraway seeds for the nostrils, and the red thread for the mouth. Place coffee beans or split raisins at hoof positions. You may use two ends of green onions or chives for the little lamb's horns. Place the green 'horns' in wooly area on top of the head. Refrigerate covered lamb until ready to serve. Note: Random placement of toothpicks will help keep the plastic wrap from damaging wool structure. Remove prior to serving. Marian wrote: I remember that we used margarine back on the farm when the milch cow went dry. I have had the privilege of mixing those little orange packets of coloring with the white margarine. I am glad that is no longer required. The lamb is darling. Easter dinner was delicious! We had fun and it was nice to see Tony and Holly on the cam. Thanks Diane!